Several prehistoric trade routes intersected in the Brooks Camp area and there was a village on the site for more than six thousand years. 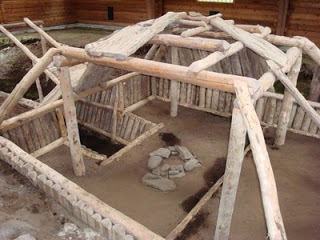 A reconstruction of one of the 900 early dwellings that have been excavated nearby gives some insight into the lives of the people who lived here. The semi-subterranean houses, called barabaras, were built of logs with a deeper excavation at the entrance that served as a cold-sink to drain away the cold air. A dome-shaped framework of wood, insulated with sod, formed the roof. There would have been a central fire that made it very smoky and warm inside. Alaska, Contempt for low-carb, Prehistoric diet. Bookmark.